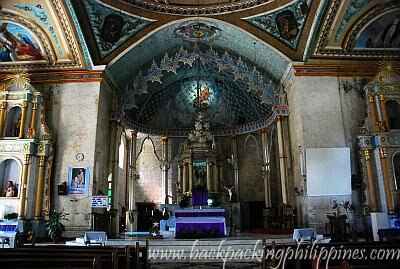 Home to the Loay River Cruise, the lost Loay Watchtower (that Tutubi tried but failed to visit) and the Clarin ancestral house, the Santisima Trinidad Parish of Loay, Bohol is a lesser-known old church in Bohol as it's also not located on the main highway. 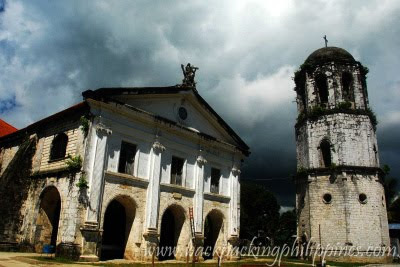 A National Historical Institute (NHI, now NHCP) narrates the history of Holy Trinity Church as built in the 1822, convent in 1838, bell tower in 1865. A certain Fr. Leon Inchausti served in this parish, a martyr of the Spanish Civil War (1936-1939) who was canonized as a saint in 1999. 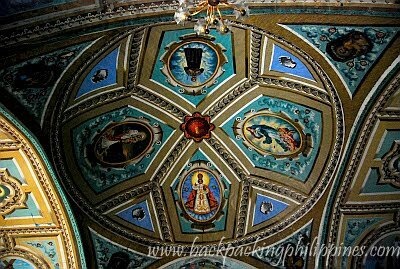 A good example of Filipino-Spanish architecture and declared a National Historical Landmark in 2003.
besides the double-facade and the historic link to a saint, the church also has an old pipe organ and can be reached via the stairs to the choir loft. I really wondered by seeing these pictures. These paintings are very good and clarity. I hope this is very difficult for us now even though we are having many latest equipment for painting. This is indeed one of the places that must be seen in Bohol. Aside from the breathtaking beach and scenic views, there are also landmarks that must be added in your itinerary like this various old church. I suppose the Baslica Del Sto. Nino in Cebu is still the older than that one in Bohol. Wasn't able to visit this place in Bohol :( how far is loay from tagbilaran port?